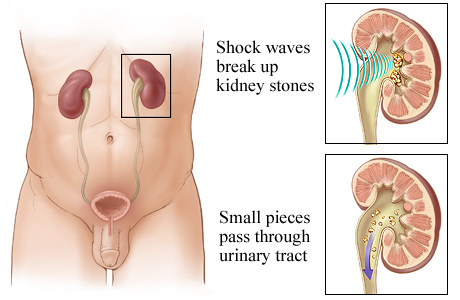 Extracorporeal shock wave lithotripsy (ESWL) uses shock waves to break a kidney stone into small pieces that can more easily travel through the urinary tract and pass from the body. 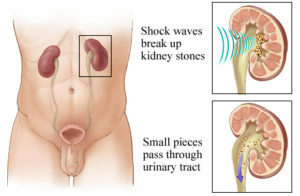 The urologist uses X-rays or ultrasound tests to precisely locate the stone. High-energy sound waves pass through your body without injuring it and break the stone into small pieces. These small pieces move through the urinary tract and out of the body. The process takes about an hour. You may receive sedatives or local anaesthesia. Your surgeon may use a stent if you have a large stone. A stent is a small, short tube of flexible plastic mesh that holds the ureter open. This helps the small stone pieces to pass without blocking the ureter.